(BUSINESS WIRE) — December 2, 2015 — Technology is at the forefront of bringing transformation to almost every aspect of life. At CES 2016, Intel Corporation will show amazing experiences made possible by technology in a wide array of consumer passions – from sports and gaming to health and fitness, entertainment and more. 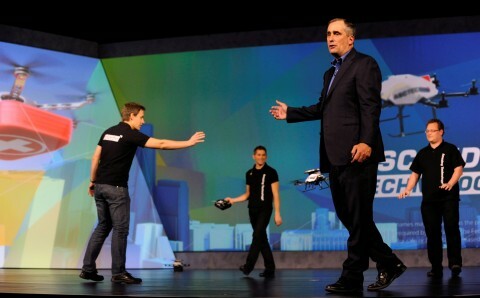 Intel CEO Brian Krzanich will deliver the pre-show keynote address. He will highlight the key trends accelerating the next wave of computing innovation and showcase how Intel technology is reshaping experiences across multiple aspects of daily life. WHEN: Tuesday, Jan. 5, 2016, 6:30 p.m. Doors open to press and analysts at 5:15 p.m.
Intel executives will join panels and events at CES to discuss trends on how technology is transforming people’s experiences. Artificial intelligence and cognitive computing have the potential to transform the way we work and live, but what are its commercial business applications, and how will it augment human work? Gayle Sheppard, general manager of Saffron Technology at Intel will join Deloitte’s Paul Sallomi for a panel discussion. Jan. 6, 10:30-11:15 a.m. CES Cybersecurity Forum: How Smart is Your Device? Gary Davis, Intel’s cybersecurity evangelist, alongside other executives from the industry, will discuss the role that security will play as the Internet of Things continues to change the way we live and work. Intel’s Genevieve Bell will join a talk moderated by Wilson Rothman, personal tech editor, The Wall Street Journal, to discuss the five technologies that will drive the $285 billion consumer technology industry. Intel’s cybersecurity evangelist Gary Davis will join the Parks Connections Summit at CES for a security panel, moderated by Brad Russell, research analyst, Parks Associates. Steve Holmes, vice president, New Devices Group and general manager, Smart Device Innovation at Intel, along with industry leaders and moderator David Pogue, tech columnist, Yahoo Tech, will discuss the ways that technology is increasingly finding its way into sports.